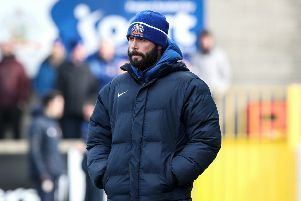 Darren McCauley is expecting a tough tie against Spartak Subotica at The Showgrounds tonight in the Europa League first qualifying round second leg. The midfielder netted a crucial away goal for the Bannsiders in Serbia last week, which could prove vital in the end. McCauley hopes a sell-out home crowd will give Coleraine a big advantage in the end, with the winners set to face Sparta Prague in the next round. Darren McCauley scored Coleraine's first goal in Europe in 15 years when he netted in the away leg last week.